I am new to ZGameEditor, and I am teaching myself how to make my own effects for the visualizer. I'm having a problem with the audio data that is sent to ZGameEditor. It lags behind quite a bit. I exported a video, and there were 7 frames (60fps) between the audio starting and the video updating the oscilloscope (over 100ms). Please post this question on the official Image-Line ZGE forums, because I check those more often during workdays. What version of FL Studio do you use and what are your FL Studio audio settings? 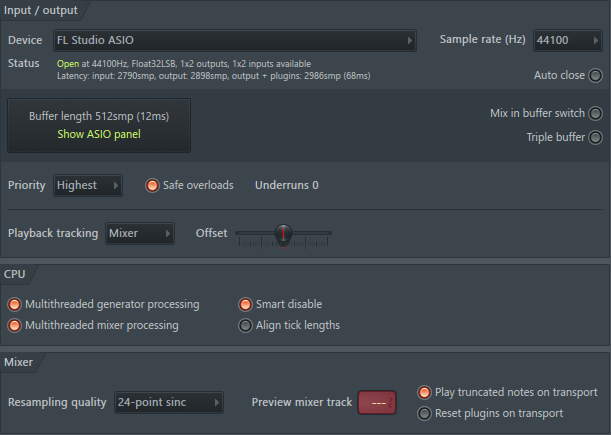 I have FL Studio 20.0.4 [build 629]. Here are my audio settings.